A world beyond GDP: are we ready yet? On the road to discover how happiness works, I learned a lot about happiness in my own personal life – and in your personal lives, too. I’ve also gained a lot of insight in happiness at work. But the main focus of my research effort has been around another question: is there something our governments can do to make us happy? Allow me to dwell on this question today, before I start my ‘sabbatical’ as a blogger. I am sure that governments can make us happier, and that they should aim to do so. There are many governments that are taking happiness-based data into account when setting policies. Gross National Happiness (GNH) in Bhutan is more of philosophical guide than a hands-on policy tool, but it shapes the narrative of the government’s action. Regions in the EU and elsewhere learn from the OECD Better Life Index and Regional Well-Being Index and from Social Progress Index (SPI). And on the local level, there is an uncountable number of projects where municipalities and social society players take happiness as inspiration in social, environmental and other projects. On one of the bigger and more abstract questions I have countered on the road is whether our data helps us to work on happiness. I’ve time and again argued that Gross Domestic Product (GDP) has plenty of limitations. Instead, I assessed the virtue of alternative indicators mentioned above. And I have been far from alone in this endeavour. 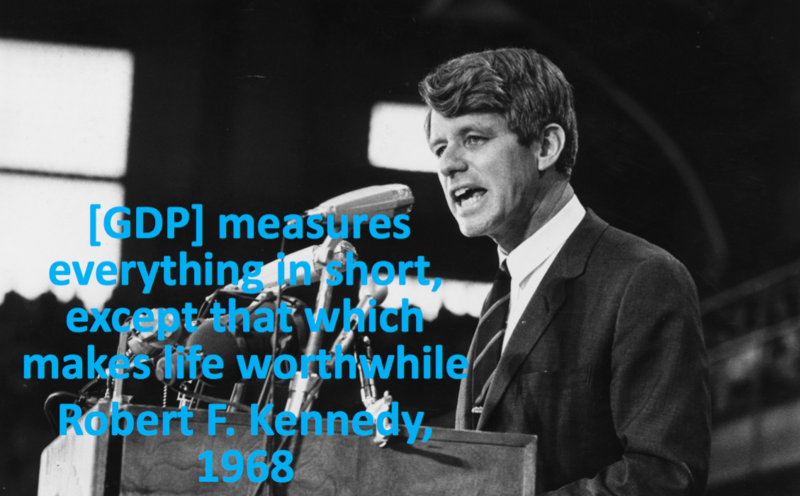 Back in 1968, Robert F. Kennedy already decried that GDP measures everything, except that which makes life worthwhile. In the last ten years, the debate on ‘beyond GDP’ has been particularly fierce. A cover article of the Economist some months ago summarised these limitations very well, and labelled GDP “an increasingly poor measure of prosperity”. Can we do without GDP? Does the acceptance of the constraints of GDP mean that a real competitor has risen to the stage? Did we get anywhere in those ten years? After three years of researching, I fear that my answers: no, we cannot yet do without . No, there is no real competitor. And no, maybe we haven’t made as much progress as we like to think. In the remainder of this post, I explain why. Can we do without GDP? Ever since its creation in the 1930s, GDP provides important information about national accounts and the size of the economy. It simply measures all production that has been created in a certain territory in a year. These data are important to inform decisions on investment, government spending, and taxation. But all too often, GDP becomes a proxy for progress or prosperity. As a tool, it only measures part of productive economy: GDP falls when a man marries his maid. Indeed, if they don’t increase the economy, GDP discounts social and environmentally desirable activities, such as household work. Furthermore, GDP is an artificial number. Figures are routinely revised, often upwards and by large margins. After a new method is used in Ireland, GDP growth is not an already significant 7.6% over 2015, but a whopping 26% as a result of some accounting tricks. Imagine the consequences: in terms GDP per capita, Irish are suddenly a lot richer, and the budget deficit shrinks by the stroke of a pen! Despite all these limitations, GDP is probably a bit like democracy. In Churchill’s words, democracy is the worst form of government, except for all the others. We still need GDP as a tool to measure economic activity, to make sense of poverty, and to determine how much tax we need to pay to run our common society. It might still be the best we can do? Or can we? In this blog, I’ve covered many alternative indicators, from GNH to the OECD Better Life Index to the SPI, but also the UN’s Humanitarian Development Index and even the Happy Planet Index. In my view, these are good as part of driving the narrative for a broader sense of well-being and progress. Tools like the OECD Better Life Index, GNH and the SPI can be helpful in spotting where governments need to focus resources to increase quality of life. But they aren’t appropriate for all economic purposes. All indicators have a stronger element of arbitrary and political choices. As such, they’re too political to be used in a more economic context. Countries simply would refuse to determine financial contributions to the United Nations based on performance in the HDI, or EU regional funds based on a regional SPI score. GDP too often is seen as the more ‘objective’ metric, and even though it is not objective or stable, it is doing better than alternatives. Intriguingly, GDP is also strongly correlated with performance like HDI and SPI, even around 80% for the latter index. Although the SPI is making advances in feeding into policy, altogether none of the indices is truly challenging the position of GDP as things stand in 2016. And I don’t think it will be very different in 2018, 2020, or 2025 for that matter. Did we make so much progress? Then, how much progress did we make in several decades of an academic debate, and overall ten years of statistical revolution? A lot has happened. Our insights in quality of life and happiness is a deeper than at any moment in history. OECD statistical offices are now routinely gathering data on subjective wellbeing, and there is a vibrant research agenda in positive psychology and related fields. Academics and practicioners, myself included, happily travel to Bhutan to learn about GNH. But what was generated out of this debate? Are we paying more attention to quality of life after the financial crisis? A single indicator truly competing with GDP has not been born. UN and EU authorities, as well as national governments and parliaments, have underlined the importance of alternative ways of measuring progress. But the reign of GDP has never been in danger. My feeling is that GDP is simply too important, and the alternatives too complex. I fear that we’re not ready for this revolution yet. Three years on the road, my doubts on the alternatives to GDP are back. I see the beyond GDP agenda as a powerful discussion, but one that has not generated a strong enough alternative to truly challenge GDP. On a personal level, this means that a reflection on my work is needed. Do I need to focus on something else? Do I need to work harder, or differently, for a state of happiness? Did I fail myself? For the moment, I’ll take a break from this blog. I’ll reflect on other steps. I deserve to take some time off for a sabbatical to read more and generate other ideas. But I am sure I’ll be back with a new programme. Because a life, enjoyably wasted in the pursuit of happiness, is a life worth wasting. Farewell! The first post on For A State of Happiness appeared ten months ago. After preparing for several months, I had promised myself to launch the blog in September. I barely made the deadline – the first post was written on the evening of Monday 30 September, in half an hour. With an allusion to Jack Kerouac, I wrote that this was my first step on the road to the discovery of happiness. And indeed, I’ve discovered a couple of things about happiness in the last year. I had promised myself to work seriously on the blog for at least a year. 40+ blog posts later, I think I am well on my way! Happiness indeed is a discovery. There are so many different ways of looking at it: from the perspectives of psychology, economics, political science, neuroscience, genetics, behavioral economics, philosophy. Learning never ends. One of the most interesting things of happiness, I think, is that happiness both a very personal thing (about our personal happiness) and a collective thing (about quality of life, well-being and the common good in a state or society). This conviction has grown more and more in me. Writing one (interesting) blog post a week on happiness is easy! Since it’s such a broad topic, there are many ways to approach the topic. The ultimate article on happiness does not exist. But with every blog posts, one element of happiness reveals itself. Every piece of a large caleidoscope of happiness. At least everybody I know. That means that both friends and strangers are interested in my endeavours to understand happiness. It has motivated me to look into aspects I hadn’t thought of, to publish elsewhere, and to create a newsletter. You might wonder what the effect on my own happiness is. I did not start this project to become happier. The aim was to understand happiness, not to be it. But still, as a side effect, it has helped me to be happier. Reading a lot about happiness, I’ve learnt how certain mechanisms in the human brain work. I’m more aware of how my brain (and my heart) react to positive and negative experiences. Sometimes I get frustrated about something small and insignificant. Maybe I miss a metro, and I’m very impatient waiting for the next one. I’ve started to diagnose myself in these situation, and tell myself: “this moment of frustration will disappear. You can’t control when the metro arrives, but you can influence how you deal with it. Just leave it”. The first year of this blog has been extremely good. Over the year, being a happiness blogger became part of who I am. And I know the next year will be very interesting as well. I have some great ideas to develop the blog and myself as a happiness researcher. I’ll work a bit on that in the summer. And after that, the road to the discovery of happiness will continue. I’m taking off August, see you back in September! And in case you can’t wait that long, take a look at some of the posts you might have missed during the season 2013-2014. A journey of a thousand miles starts with a single step, the saying goes. Today, I am quietly setting a foot outside of my door. Looking outside, into the wide world, with a curious glance of what happens around me. My first step, on a road of which I am not sure where it leads. Sometime ago, I decided I wanted to understand better what makes people happy. Happiness is such a complex thing that we will never be able to truly grasp how it works. 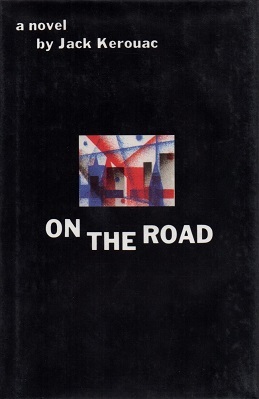 But still I believe it is worthwhile to get on the road and find out what makes individuals, and societies happy. This blog is dedicated to that journey. I believe that intuitively human beings very well know what makes them happy: the company of other people. Cooking and enjoying a great meal with fresh ingredients. The thrill of seeing a new place. Yet, at the same time, we often act irrationally and forget to be happy. We force ourselves to work too long hours or let technology that is a weak proxy for human interaction take over our lives. Similarly, on the level of countries, we have given rise to a system where governments seem more concerned about our wealth than our well-being. My journey (and my co-editor Wendy’s) will be leading to the place where I can discover why we are as we are. To discover how it could be different. I would like to meet people – you – who have stories about happiness. I’d like to speak to organisations who have spend their thinking power to figure out how we can apply the lessons from science happiness and well-being in our daily lives. This blog is the travel journal of this journey. At present, I like to think of it as a beta version. But hey, I’ve just set the first steps out of my house. I haven’t crossed the corner yet. I am just stretching my legs a bit. I might have to tie my shoelaces a bit further. I might need another backpack in some weeks. But I’m on the road. To the discovery of happiness. For more about the purpose of this blog see the page – guess what? – about.